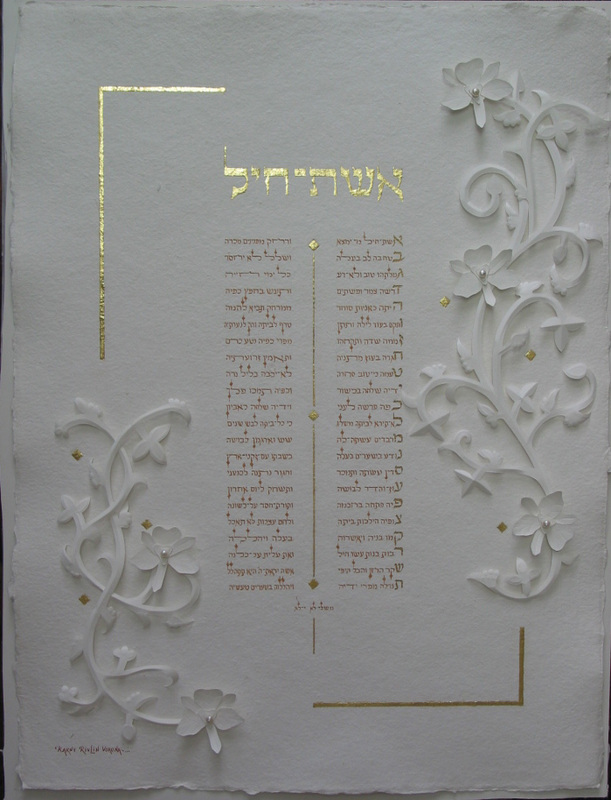 Eshet Chayil is written in copper paint with the Alef Beth letter in Shell Gold. The illumination done in the Paper-Sculpture technique with Orchids which are nesting freshwater pearls and silver studs. The 23K Gold Leaf is a nice accent to contrast the white on white design. The artwork got the Papeterie Saint-Armand Award at "The Art of the Book ’08" Canadian Book Artists and Book Binders Guild- Juried Exhibition traveling Canada for two years. Ink: Gouache, Dry Pigments, 23K Gold Leaf, Freshwater Pearls and Silver studs.